While winter churns its way toward spring, here in the heart of January, I contemplate the road already traveled and make plans for the trip to come. As an assist to my musings, the WordPress.com stats helper monkeys prepared this 2015 annual report for my blog. (See below) How useful to see what I’ve been doing. Useful and instructive and a goad to starting the new year well. First, I look back at that which was. Since most of 2015 was consumed by work on my first novel, I wrote fewer blogs than I intended and fell behind in following others. I expended the bulk of my energy on my debut novel, The Dark End of the Rainbow. (Oh, and there was the brain surgery and the procedure to remove a skin cancer from my nose, but who wants to dwell on those procedures?) My well-intentioned vow to post more blogs was swallowed by the need to polish, publish and publicize the book. Then, I glance ahead. Most of 2016 will be taken up by work on my sophomore novel, The Rules of the Game. I see no way to avoid the intense concentration required to take this idea from kernel to full-blown pop. For me, immersion in the creating and the revising entails pursuit of the writing with single-minded fervor. I find it difficult to digress to other projects. Perhaps my resolve to post more blogs will drift away as it did in 2015. This is a problem I am determined to solve. But how? Recently, I had the opportunity to ground my mental checklist in a visual way. 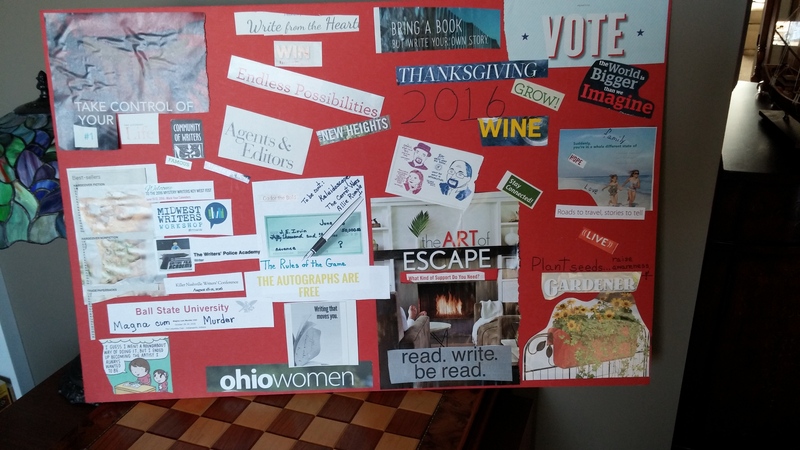 A group of writers from the Dayton area met for food and fellowship and to create vision boards to help us focus on the year. We searched through magazines for pictures and words that fit the goals we hope to achieve this year. This concrete and tactile effort allowed us to ‘see’ the dreams we hold for ourselves, as writers and as human beings. Still, amidst the creative, the grand wish to create and publish, there must be the mundane, the chores and the errands that keep us all grounded in the reality of daily life. And it is the details of our lives that give substance to our creative ones. How can I reconcile these two necessary parts of my whole? At the meeting, I took a poster board and began to dream. Not surprisingly, my selections from the magazines were more prose that pictures. Write from the Heart… read, write, be read… the world is Bigger than we Imagine. To no one’s surprise, each writer in the group chose to visualize her year in a completely different way. Several boards contained more pictures than writing, more family goals than individual ones, more specific plans than general ends. We found the process and the outcome so delicious, we’re going to reconvene for Vision Board 2.0, come back together to describe and discuss our boards. In the sharing, we hope to find strength and support for the work ahead. You know, newspaper advertisements at the beginning of a new year include, with some frequency, organizing items: bins, shelving, storage units. It is such a basic human proclivity, to clarify at the beginning where we hope to be at the end. Creating a vision board is a writer’s way to do that for our work. The idea is not mine. It is borrowed from other visionaries, who coupled writing and art to allow those of us who work in words to express our goals in an artful way, a way that allows us to focus and refine. My vision board is not static. It is a fluid reminder of where I’ve been and where I hope to go. I can add or subtract, revise and re-vision. And each day, as I sit down to write, I see the path I’ve laid out for myself and take the first step. Again and again and again, until I reach the end. A San Francisco cable car holds 60 people. This blog was viewed about 270 times in 2015. If it were a cable car, it would take about 5 trips to carry that many people.